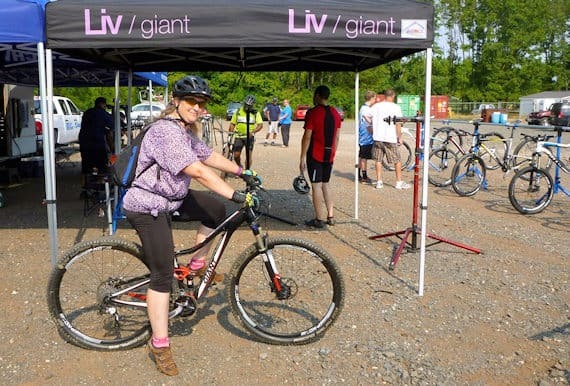 A big thank you to everybody who turned up for the Giant bike demo this last Sunday. And thanks also to Jordan and Levi from Giant who brought the roadshow to us. Sorry to those who had to wait to ride the bike of their choice – there was a huge demand – and sorry too to those walkers/hikers who didn’t realize that the fact there are any paths at all to walk on in the Six Mile Run park is because cyclists/mountainbikers have labored and sweated to blaze paths and build bridges so everybody can enjoy this wonderful facility. Perhaps after the next storm we’ll see hiker groups and dog-walkers putting on their hard-hats and winding up their chainsaws at six in the morning to clear paths and make the park safe. 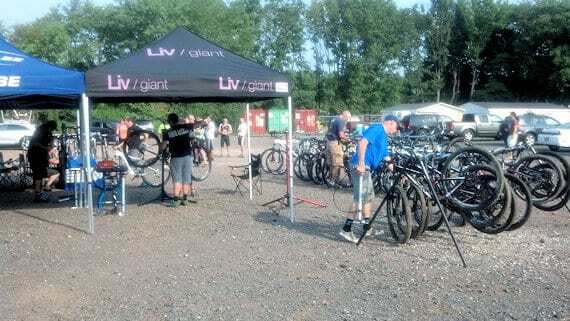 Anyway, off my soap-box; demos hosted by Halter’s to be announced; Cannondale bikes, Giant/Liv women’s bikes and Giant cyclo-cross bikes in the fall. The Demo will take place at Six Mile Run State Park, NOT at the bike shop. Keep up with the latest details on FaceBook. Over the years the basic bicycle has evolved into a number of configurations, some good for general use, some with specific intentions. So which bike is best for you? 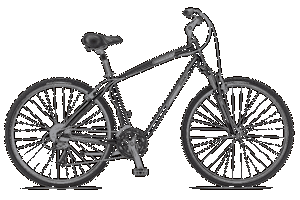 Cruiser bicycles : A long wheel-base and low center of gravity makes for a very stable ride and comfortable upright stance for the rider. These bikes are excellent for cycling around your neighborhood or round town. 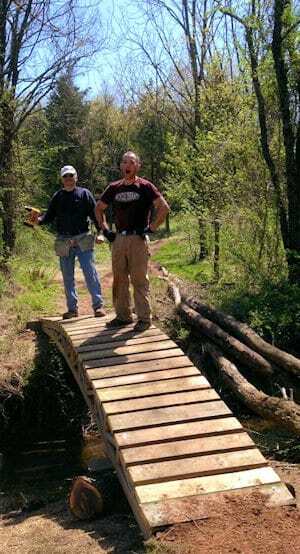 They will also negotiate smooth off-road routes like the canal tow-path and trails through parks. The low seating position makes it easy for anyone to get their feet onto the ground so it’s perfect for the nervous rider. Cruiser bikes are not so good if your rides include a lot of hills or you’re intending to take on longer, more ambitious rides. Hybrid Bicycles : If you want to break out of your neighborhood on your bicycle and ride as part of a healthy life-style regime then a hybrid bicycle could be for you. 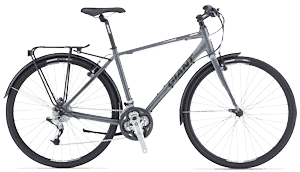 Hybrids will keep you in an upright stance, but in a higher, more efficient position which makes climbing hills and cycling longer distances rather easier than on a cruiser. Sports and Fitness bicycles : These bikes are a lightweight, non-suspension, development of hybrid bicycles. Almost, but not quite, straight handle-bar road bikes, but still capable of riding made up paths and trails, these bikes appeal to the person seeking to expand their bicycling horizons and get a bit of a workout at the same time. 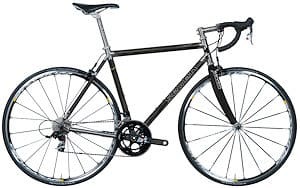 Higher end S&F bikes are approaching the cost of a good road bike, so if you’re considering purchasing at this level seek the advice of your local bike store to make sure this type of bike really is for you. Mountain Bikes : For many people this is their entry point to cycling. Traditionally, MTBs have been characterized by fat 26″ tires, but now most of our higher end bikes use 29″ wheel (29ers), the same diameter as a road bike, but wider. MTBs have their own sub-genres; XC, all-mountain, downhill, freeride, etc. The NJ terrain was made for hard-tail 29ers. Their ability to roll over the typical surface here will suit most people. If gnarly, rocky trails are your forté then consider a full-suspension bike, although at any price point a hard-tail will have superior components to a full-suspension bike. Further developments of MTBs include the Fatbike with immense wheels capable of rolling over soft, granular surfaces such as sand or snow, and the Single-Speed MTB, no gears, no suspension for the back-to-basics crew. Men’s and Women’s Road bikes – performance and comfort/endurance geometry … but which one’s which? 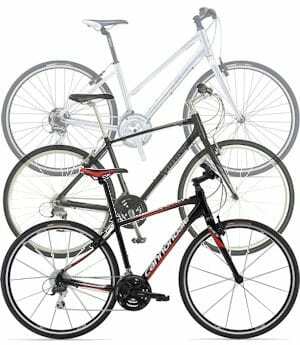 Road Bicycles : If you want to ride the maximum distance with the greatest efficiency then you must consider a road bike. Don’t be put off by skinny tires, narrow saddles and drop-handlebars. These bikes are designed to be ridden over many miles, hundreds, even thousands of miles. No one will do that if they’re uncomfortable on their bike. All road type bikes offered by Halter’s are only sold with a personal bike fit. This is by appointment only – just call the shop – and can last a couple of hours, but will certainly provide you with the best, most comfortable and efficient ride within your budget. Road bikes fall into a couple of categories; men’s and women’s and performance and comfort/endurance. Don’t get too caught up in definitions. The right bike is determined by an arcane formula determined from its intended use, your height, proportions, flexibility and just how you feel when riding it. Taller women will fit a “men’s” frame better, and shorter men with proportionately long limbs may suit a “women’s” bike. Classic road races have been won on “comfort/endurance” frames and tall guys with short legs may find a “performance” frame more comfortable. So what we’re saying is, “It all depends …”. Only a professional bike fit can determine this for you. There are also a number of variations of road bike built to accommodate different challenges. Cyclo-cross Bicycle : Cyclo-cross (CX) is a huge sport in the winter in Europe where riders race on short courses across fields and park lands either in mud or freezing temperatures … Sounds like fun, huh? Well, there is a thriving CX scene here in the US if you feel the need. However, CX bikes also make excellent commuter bikes because of their ability to accommodate wider tires, fenders and luggage racks. Touring Bicycle : Whether you’re a credit card tourist flitting from B&B to B&B, or riding a self-sufficient epic coast-to-coast ride, the appropriate touring bike will help you eat up the miles while specially adapted to carry the necessary paraphernalia – tent, sleeping bag, stove, clothes, etc. Triathlon or Time-Trial Bicycle : First time customers often present themselves in the shop with the purpose of buying a tri-bike. 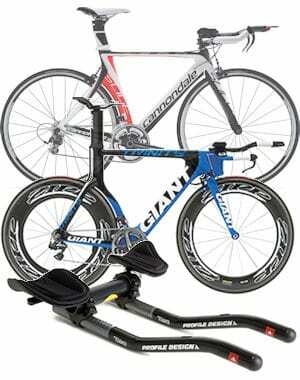 Be in no doubt, a tri-bike is the most specialized and focused bike we sell. In comparison to a regular road bike tri-bikes have delicate handling, less efficient brakes and comfort can be compromised by the need to get from A-to-B as fast as possible. Most bike clubs also prohibit tri-bikes on club rides. Most committed triathlon customers ride a regular road bike for training and transfer to their tri-bike just prior to competition. Road bikes can be adapted with the addition of a tri-bar and some fit work which is more than good enough for most competitions. 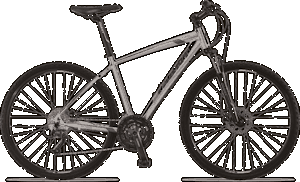 Custom-Built Bicycle : If you have very particular requirements, or if only the best is good enough, then consider having a bicycle tailored and hand-built for you. Nothing will work for you better. After a personal consultation with our expert bike fitter, Seven Cycles will build you a frame from steel, titanium, carbon fiber or a blend which will fit you like a glove and have exactly the characteristics you specify. Halter’s will then add the finest and most appropriate components for the most exclusive bike you will ever own. Halter’s sell bicycles and frames by: Cannondale, Electra, Giant, Salsa and Surly. We will also build you a bike to your specification from a fixie to the ultimate bespoke bike from Seven Cycles. We also sell frames from a number of makers including All-City and Tom Ritchey. First of all, let’s get a couple of things out the way. Buying a child’s bike in your favorite independent bicycle store is going to cost you more than in a big box discount store. Bike shop quality children’s bicycles are built from quality parts, often the same components as found on adult bikes. They are diligently assembled by experienced bike-mechanics to deliver your child a safe, properly designed and durable bicycle. The shop will also have the resources and the commitment to resolve mechanical, safety and warranty issues which may arise. A cheap bike only looks like a bike. It’s a toy, not a bike. Issues will often cost more to remedy and repair than the original price of the bike. And there will be issues. Secondly, it is the law in New Jersey for children under the age of 17 to wear a cycling helmet when riding a bike. More about this here and here. One of the first decisions to make when considering your child’s first bike is whether or not to use training wheels. Recent studies indicate that children learn to ride a bike faster and with more confidence using a balance bike. 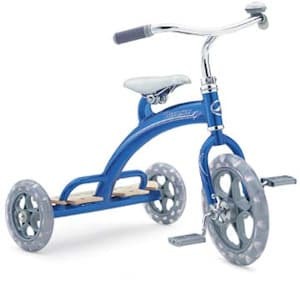 A balance bike dispenses with pedals so the child scoots along supported and propelled by their legs. Children often acquire this skill surprisingly quickly. Indeed, the most effective way to encourage your child to ride a bike is to give them a balance bike, a helmet and a grassy slope. They will be well on the way to riding a two-wheeled bicycle in a very short time. 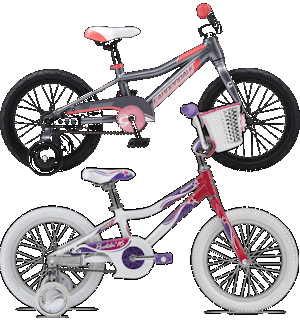 16″ children’s bikes with training wheels and coaster brakes. However, most children’s bicycles with wheel sizes between 12″ and 16″ – standard bike shop sizes – will come with training wheels, and some 20″ wheel bikes can have training wheels fitted after purchase. 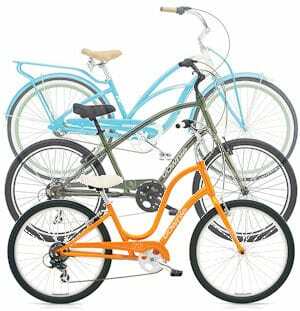 12″ and 16″ wheel bicycles feature coaster type brakes. 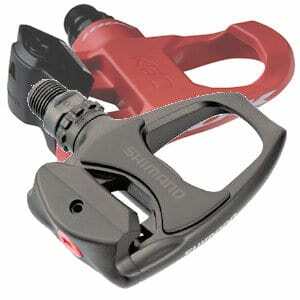 That is brakes which work when pressing the pedals backwards. Some 16″ bikes also include a hand brake controlled by a lever on the handlebar. This is useful for older children since it introduces them to the type of brake they’re more likely to use as they progress onto larger bikes. 20″ wheel bikes have a number of configurations from cruiser-type bikes with coaster brakes, BMX and mountain bikes with gears and hand-brakes. 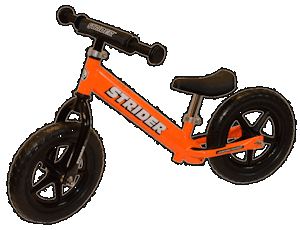 The largest child’s bike size, the 24″ wheel, is also available in many types, from cruiser to fully featured mountain bikes with suspension and gears. Lastly, older children and teenagers may be more suited to a full size adult bicycle. Many are available with extra-small frames which taller children can ride safely. This will cost you a little more, but your child will have a bike which will fit them for a long time to come. Halter’s stocks a range of quality children’s bikes from Giant, Cannondale and other makers. All our bikes are backed by the manufacturers’ warranty and our expert service. We also supply infant tricycles and can advise you on adaptive bicycles for children with special needs. If you’re looking for a bike that can cruise round your neighborhood, take a ride on a canal path or trail through your local park and commute around your town, then a hybrid bike might be the one for you. Hybrid bicycles blend characteristics from more specialized road bikes, touring bikes and mountain bikes to create a general-purpose, user-friendly bicycle. Their stability, comfort and ease of use makes them popular with beginning bicyclists, casual riders and urban commuters. Hybrids may integrate the flat handlebars, upright posture and brake system of a mountain bike. They may also have numerous accommodations for accessories (front and rear racks, water bottles, and fenders) typically found on a touring bike. Many also have the larger wheel diameter (e.g. 700c) and lighter components of a road bike — and a rim/tire configuration that falls between the road/touring bikes and mountain bikes. Basic hybrid bikes will have rigid forks, but probably a suspended seatpost to absorb the bumps in the road. Higher end models will use a suspension fork for further comfort. Halter’s favorite basic hybrid bike is the Giant Cypress available in a number of variations, from rigid forks to suspension forks. Higher end models also feature better drive-train and brake components. Cypresses are available in regular (men’s) and step-through (women’s) frames. 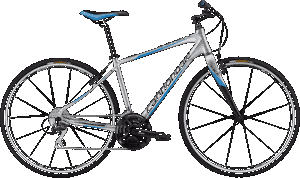 Sports and Fitness bikes are a recent development of hybrid bikes. With lightweight frames and more responsive geometry, these are almost straight handlebar versions of drop handlebar road bikes, but with a more relaxed frame geometry. Rugged enough to be ridden on a trail, these bikes are most suitable for the rider who sees themselves riding several miles on the road for an extended workout. 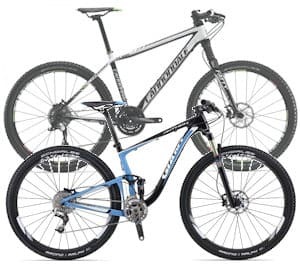 Check out the Cannondale Quick or Giant Escape for the best in in Sports and Fitness hybrids. 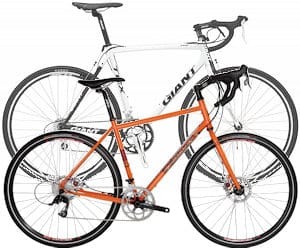 Commuters looking for a less costly and more rugged alternative to a road or cyclo-cross bike for their daily commute or just running errands should try the Giant Escape City. 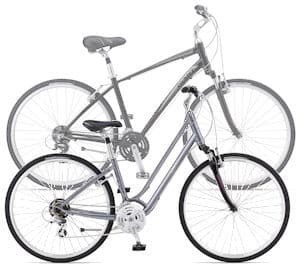 Available in men- and women-specific configurations, these bikes feature fenders, kick-stands, racks and other accessories useful to the utility cyclist. Just add lights and panniers and you could transform your daily commute as well as save the planet. For people looking for a more challenging experience without making the jump to a mountain-bike take a look at the Giant Roam. 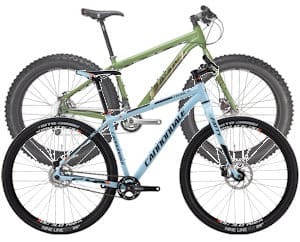 Rather lighter than a mountain-bike at this price point, the Roam features front suspension, which can be locked for riding on the road, hydraulic disc brakes and other advanced components. There are a lot of good reasons for buying a hybrid bike, a Jack-of-all-trades. They are great bikes which do exactly what they say they will, but if you have greater ambitions; regular 20-30+ mile road rides, cycling as part of a committed exercise regime, serious off-road/cross-country adventures, touring Peru, then get into your local bike shop and ask their advice, try a few bikes. Find out what exactly meets your needs. Halter’s stocks a full range of hybrid bicycles by Giant and Cannondale. We can also advise on alternatives by other makers such as Electra and Salsa.